Estepona has become a reference this summer to go to enjoy the beach and the different activities that have been proposed in the city of Malaga. 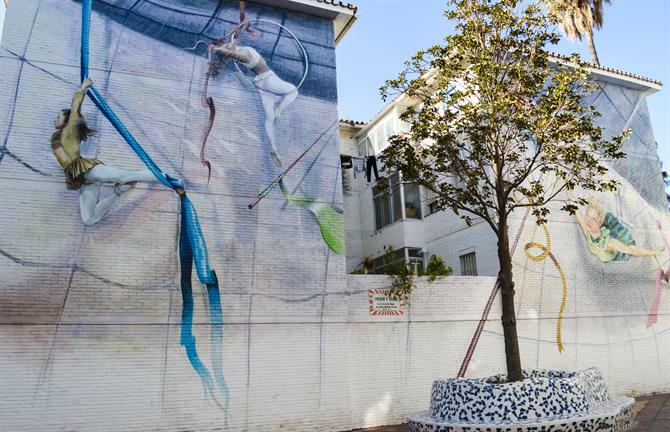 However, if there is something that Estepona highlights is its spectacular murals, which can be found throughout the city, different scenes and different artists that make up the city as a huge canvas outdoors. The more than 40 murals that are found throughout the city, make Estepona the city of murals. These murals have become a tourist attraction and a benchmark to show those closest to these works of art. The different murals that exist in Estepona have managed to fascinate visitors coming to our city, in addition to having made numerous photos that have gone up in social networks sharing them with their friends and family. Each mural is inspiring for everyone who visits it, where the details of these works of art gracefully decorate the entire city. 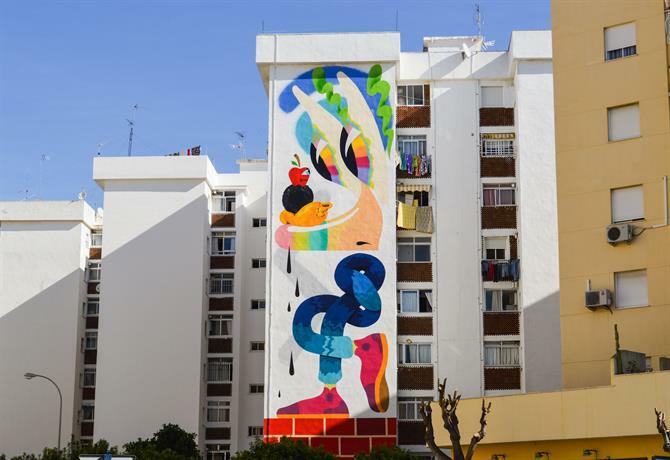 These murals represent the character of the city itself, with the cheerful tones inspired by the sea, the elegance in traces and clarity of each of the murals, among other things. 1 – QUIJOTE DEL S.XXI de Curro Leyton. C/Eslovaquia (IES Puerta del Mar). 2 – MUSAS de Lalone. Avda. Puerta del Mar. Torralba “Anula Mixtura”. Edf. Vista África. 4 – ÁNGEL, EL BUCEADOR de Eric Aman. de Conchi Álvarez. C/Tres Banderas. 7 – SIGLO XXI de Néstor Prada. Plaza ABC. 10 – HOLA de Edmon. Colegio Ramón García. Romero. Avda. Juan Carlos I (Bda. San Isidro). 14 – LLEGANDO A TU DESTINO de Dourone. Prolongación Avda. San Lorenzo, 17. 15 – ALMAS DEL MAR de Blanca Larrauri. 17 – DESDE EL MAR de José Fernández Ríos. 18 – OBRA ARTÍSTICA de Juanjo San Pedro. Auditorio Felipe VI (en horario de apertura). Joaquín Aguilera. C/Pilar de Farinós. 21 – SAN ISIDRO LABRADOR de Blanca Larrauri. 22 – PARAÍSO GOLF de Manuel León. 23 – LA VENUS DE ESTEPONA de Cecilia Salinas. C/Terraza (Barriada Mar y Sierra). Zosen y Mina Hamada. C/Terraza, 152. “Nano4814”. C/Mantilla (Bda. Mar y Sierra). 26 – DÍA DE PESCA de José Fernández Ríos. 28 – MADRE AMOROSA de Francisco Alarcón. Ríos. Parque Botánico y Orquidario. 31 – FREAKS de Rebelzer. C/Granada, 16. 33 – PASEN Y VEAN de Elena Aguilera. Fernández Ríos. Plaza Antonia Guerrero. LIBERTAD de Francisco Alarcón Pérez. 36 – AGUA en sistema Braille de Fran Redondo. Joaquín Aguilera. C/Dos de Mayo (Bda. Solís). 39 – LA IMAGEN VUELTA de Fernando Clemente. Ríos. C/Ntra. Sra. de Los Remedios. Salinas. C/Formentera (Bda. Los Televisores). 42 – LA LUNA de Dadi Dreucol. 45 – AZUL Y PLATA del Colectivo “Moraga”. Avda. In addition, coming to Estepona and living it as the city of the murals comes accompanied by visiting our most popular Estepona restaurants. Here we have the El Hatillo Arroceria with a variety of more than 18 types of rice. L’Oriental, a restaurant with real Lebanese food in the middle of the Mediterranean Sea. Casa Doña Jerónima with real food from the north of Spain, with a traditional and avant-garde blend. What do you think of Estepona as the city of the murals?